Theoretically, how much money you need in retirement depends on a number of factors, but the hard one is - how long you will live. Although there is no crystal ball for this, we know that improved healthcare and advances in technology has resulted in people living longer than their parents’ generation. When budgeting for retirement, you need to consider your life expectancy, your lifestyle and medical history as well as your family’s life expectancy and medical history. Current life expectancy statistics state that men can expect to live up to 86 and women to age 90. This means if you retire at 65, you need to fund your living expenses for at least 21 to 25 years, if not more. Remembering however that these are ‘average’ life expectancy figures, so if your family has a history of longevity or early death, then you’ll need to make allowances accordingly. Often an approximate rule of thumb is used as a standard retirement savings measure. This rule states that the annual income you will need in retirement is around 70-75 per cent of your net income in the last year before you retire. Whilst helpful, this rule of thumb isn’t too useful for those people 10 years or more out from their retirement, as they’re not likely to know what their pre-retirement income will be. An alternative method used is the ASFA Retirement Standard, which benchmarks the annual budget needed by Australians to fund either a comfortable or modest standard of living in retirement. As at March 2014, a couple (who own their own home) looking to achieve a comfortable retirement needs to spend $57,817 a year, while those seeking a ‘modest’ retirement lifestyle need to spend $33,509 a year. These figures are updated each quarter to take into account the impact of inflation and rising costs. It is probably safe to assume that most of us would prefer to live a comfortable rather than modest retirement, so as a general rule of thumb, let’s use the Comfortable AFSA Retirement Standard of around $58,000pa as the required income for a couple in retirement. In order to provide $58,000pa income in retirement, whilst still preserving the capital value of your savings, you may need somewhere in the order of $750,000 to $1 million in savings on retirement. These figures are based on a net return of 6%-8%pa return. 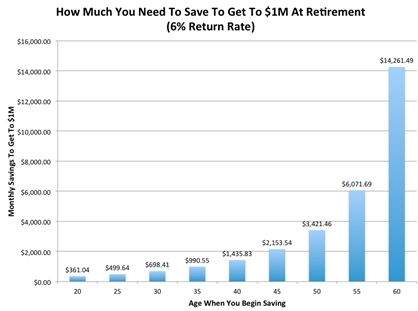 We’ve calculated how much money you would need to set aside each month, if you start at different ages, and under different rates of return, in order to end up with $1,000,000 in savings at age 65. The benefit of saving from a young age is that you have more time up your sleeve and you can spread out the total principal investment over a much longer period. 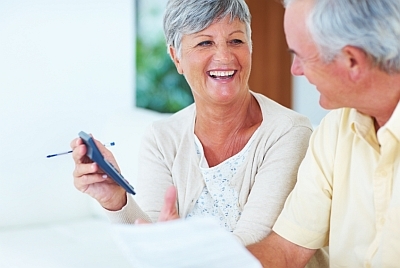 You can also benefit from compound interest to help boost your retirement savings. You can see there is a large difference in monthly savings amounts for each 2%pa change in investment return. The bottom line: It’s never too early or too late to start planning for your retirement. If you want to see where you stand at present based on your current savings and contributions to super, ask your financial adviser to pinpoint where you are now and help you work out how to build on this wealth and maximise your savings in preparation for retirement. Rarely do things always work out so smoothly. Investment returns will differ each year and you may have some years where you can save more than others. With the superannuation guarantee contributions being made for us, this helps with the monthly savings that would be needed. Another area that can have an effect on savings and retirement lump sums or income streams is taxation. No-one ever wants to pay more tax than they have to, if you are receiving investment returns of some kind (capital or income), it is important to consider the taxation consequences.